That can be a small box, now don’t believe that just because it’s a small box that it is of no value, can you think of something very valuable that comes in a very small box. Salvation is beyond any value we can place on it but once we have received salvation it is God’s desire for us to grow in faith in His word and in Him. The great thing is that Jesus wants us to get a bigger box as well. In the two events of the multiplying of the fish and loaves we can see this. In the first one the disciples come to Jesus telling Him to send the people away because they could not provide enough food to feed them all, (Mark 6:32-43) and in the chapter 8 we see a similar event in which Jesus comes to them and asked the question to see if they had learned anything from the first event. I wish we would have seen this event occur third time for I’m sure the faith of the disciples would have been to the point that they would have just had the people seated with plates, forks and napkins. 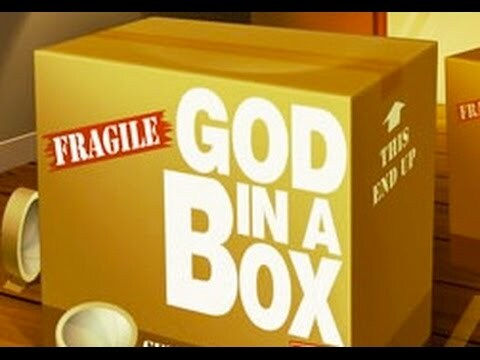 We need to get bigger boxes or at the very least open the top so our faith can be expanded for whenever we believe that a situation is to big for God we are shutting Him in a box or putting God in smaller box. When we are not sure we can receive our healing, when we don’t believe He can help us in our provision, when we can’t shake an addiction, when we have family issues we are putting God in a box. Natalie Grant has recently released a song that is very powerful called, “king of the World” and I encourage you to listen to it, for one verse says, “I try to put You in the box that I’ve designed” which really describes how we treat our faith in God. Let’s bust the box or at least imagine a box that contains the entire Universe, for its time for miracles to happen in your life that will transform your life forever, remember for in the beginning God just had to speak and it became, do you think His power has shrunk since then?